One of the best things about coffee is that it can be enjoyed hot or cold. Start the morning off with a nice hot cup, and by the afternoon keep the caffeinated train going with an iced version. If there is any lull between cups of coffee, and it gets hard to concentrate or pay attention, Mr. Coffee has your back. 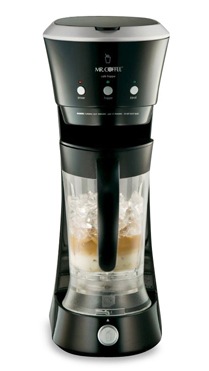 The Mr. Coffee Cafe Frappe Maker is a simple to use coffee-making gadget that brews and blends in three minutes time. Just add ingredients and press a button. The 20-ounce capacity blending jar will soon contain enough magic elixir for you to make it through the day—or at least until the next cup of coffee.